Importance of never ignoring signs of lameness. So, your horse is limping! What can you do to address the problem and how should you go about it? The anatomy of the equine with fine slender legs and a large body, puts the horse in a precarious position. It is in your best interest as a horse owner, to take prompt action any time you have the least suspicion that something is not right with your horse, especially when it comes to any indications of lameness. Fortunately for horse owners, on-going research related to lameness is a priority for many veterinarians, farriers, and animal health care researchers. The anatomy of the equine with fine legs and a large body, puts the horse in a precarious position, and, as a horse owner, taking prompt action when it comes to any indications of lameness can save time and money and possibly your horse's life. Everything from glue-on horse shoes, to foot impression film, to nerve-blocking diagnosis to lameness locator technologies are being developed to help horse owners and their medical advisers more quickly diagnose and treat lameness. For the horse owner discovering a lame horse, careful observation is the key to identifying what is causing the lameness. Using your eyes and your hands as you examine your horse and observing your horse in action, may help you to locate the cause of the lameness. Most lameness problems involve a structure in or below the knee or hock, so, as you move forward with your observations, pay close attention to the legs and feet of your horse. 1. Begin with the feet, since many cases of lameness begin here. Pick the horse's feet and make sure no rocks are wedged into crevices. Look for dark spots that might indicate a bruised sole. Check for discharge or odor. Look for cracks, and check to see if the hooves have been trimmed too short, if a nail is close to the sensitive structures of the hoof, or if the shoe doesn't fit properly. Move the heels, tap the hoof wall, and use hoof testers if you have them. Feel the hooves. Is one hoof warmer than the others? Do you find a pounding pulse? If so, these are indications of injury or possible abscesses. 2. Check the lower legs for heat and swelling that might indicate inflammation. The horse may have an injured tendon or ligament. 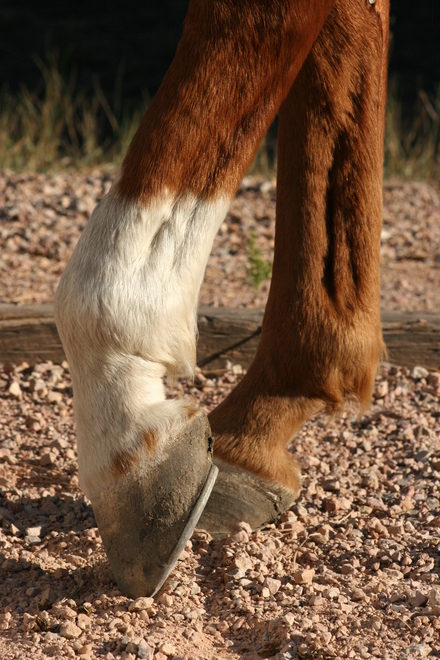 Note any abnormal stance such as favoring one leg, pointing the toe, or a dropped fetlock. Look for wounds or injuries to the lower legs. Has the stifle slipped and locked? A horse may have a bone chip floating in the joint. Flex and extend the joint to observe range of motion and to check for pain. Note any areas that are inflamed, as evidenced by heat and swelling. 4 Check the neck and back for symmetry, posture, and contour. As you move your hands over the horse's neck and back, notice any indications of swelling, pain, heat, inflammation, or loss of muscle tone. Does your horse flinch when you approach with the saddle or move away from your touch when you attempt to brush the neck or back areas? 5. Now, check the horse's gait on a level, even surface with several maneuvers including a walk and a trot, in a straight line and in a circle. Your objective is to determine which leg is affected or if more than one leg is affected. Also, does the problem originate in the leg, or does it originate in the horse's neck, or back? 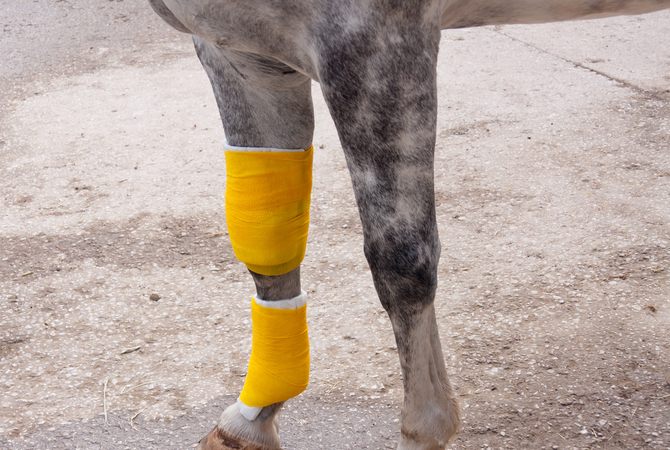 Lameness produces minimal weight-bearing in motion and/or at rest or a complete inability to move. In other cases, once you have observed your horse in an attempt to discover where the lameness originates and how serious it is, you most likely will need to call your farrier or veterinarian to confirm or determine the diagnosis and treat the problem before the condition worsens. A surprising majority of lameness cases involve the horse's foot. The farrier can can often diagnose and correct a lameness causing condition of the foot. If the problem appears to be related to the horse's lower limbs, feet, or hoofs, a farrier may be able to diagnose the problem and provide corrective treatment. A farrier will be able to recognize problems that result from orthopedic diseases of horses, laminitis, sand cracks, flat feet, corns, sole bruises, navicular disease and contracted heels, among others. Your farrier has a knowledge of the anatomy and physiology of the horse's lower limbs, is familiar with common foot and hoof problems and specializes in hoof care. With this expertise, a farrier can often determine the cause of lameness and devise and use corrective measures to treat the problem. In addition, a farrier will be proactive in preventing development of hoof and limb problems by making sure hooves are balanced, shoed correctly for the horse's work, and will note any signs of trauma or infection in the lower limbs and feet. When speaking of the makeup of the horse's feet and hoofs, University of Pennsylvania School of Veterinary Medicine Farrier Patrick T. Reilly notes that,âThe best way to explain it is that a horse is walking on a modified fingernail.â Keeping this in mind, Reilly has made great strides in both assessing and treating hoof problems. Using a force-sensing film attached to a small electronic recording device that measures the stresses on the horse's foot as it walks, Farrier Patrick T. Reilly uses that information as he works toward making better shoes to treat various forms of lameness in much the same way as a podiatrist assesses and develops orthotics for humans. Farrier Patrick Reilly also applies glue-on shoes to a horse to relieve inflammation in horses' feet. For people unfamiliar with shoeing, this inventive procedure may not sound groundbreaking, but, whereas nailing a shoe into the hoof of a horse impairs the hoofâs integrity, a glue-on shoe â which uses fabric to bond the orthotic to the outer surface of the hoof â actually reinforces and strengthens the hoof. Penn State holds the patent for the glue-on shoeâs design. As a starting point for his examination, your farrier will usually check for trouble spots in the foot and hoof along with noting any puncture or other kinds of wounds, diseases of the frog, heat, swelling and increased pulse that indicate infection, disease, or injury by using a hoof tester. Equine laminitis is the #2 killer of horses every year, but according to the National Animal Health Monitoring System, 50% of the laminitis cases seen could be prevented through correct nutritional management! Considering that almost 5% of horses that undergo surgery for laminitis end up dead or humanely euthanized, it is in every horse owner's best interest to understand this disease and how nutritional management affects it. A farrier will be able to recognize problems that result from orthopedic diseases of horses, laminitis, sand cracks, flat feet, corns, sole bruises, navicular disease and contracted heels, among others. Corrective trimming and shoeing form an integral part in treating these diseases and conditions. In addition, contracted flexor tendons, tendonitis, ligament injuries, ringbone, sidebone, bone spavin, dropped sole and cunean tendon bursitis also respond well to corrective trimming and shoeing. In some cases, such as white line disease (seedy toe) and puncture wounds of the white line, the farrier will pare out diseased horn and unsound tissue, pack the cavity with betadine dressing and treat the hoof until healthy horn begins to develop. Prosthetic hoof repair material and special shoeing techniques are used while making sure that any predisposing conditions are treated and corrected. Farriers are often called upon to repair various types of hoof wall cracks, chipped and elongated hooves, and to do corrective trimming and shoeing that solve problems with conformational hoof and limb imbalances. Although your farrier may treat a wide range of foot and hoof problems, your horse may need the more advanced medical knowledge, diagnostic tools, and facilities associated with your veterinarian. Fortunately, most farrier's have your horse's best interest at heart and will readily recommend the services of your veterinarian if they find that your horse's lameness needs further evaluation and treatment. 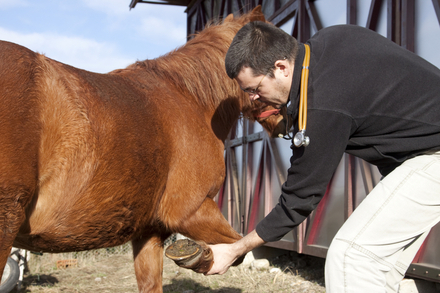 Veterinarians are well aware of major horse diseases that lead to lameness such as laminitis, navicular disease, and degenerative joint disease which may lead to chronic lameness. If not caught early-on and treated properly, these diseases affect the usefulness of the horse or may result in the horse having to be euthanized to prevent further suffering. For this reason, it is very important to call a veterinarian if an owner or farrier cannot quickly discover the cause of a horse's lameness. Because the causes of the lameness may be difficult to diagnose, a systematic exam is performed by the veterinarian to pinpoint to problem. Part of the evaluation includes the veterinarian holding the horse's limbs in a flexed position, then releasing the leg, then watching as the horse trots away for signs of pain, weight shifting, or irregular movement. 1. Taking a medical history. 2. Doing an evaluation of the horse in motion with particular attention paid to any deviations in gait, failure to use all four feet in sync, unnatural shifting of weight from one limb to another, head bobbing, stiffness, shortening of stride, and irregular hoof placement. 3. Part of the evaluation includes the veterinarian holding each of the horse's limbs in a flexed position, then releasing the leg. As the horse trots away, the veterinarian watches for signs of pain, weight shifting, or irregular movement. 4. Completing a physical examination of the horse using palpation and manipulation of muscles, joints, bones, and tendons, joint flexion tests, and application of hoof testers to reveal evidence of injury or stress. The physical examination will also appraise conformation, weight-bearing, and balance. 5. Drawing blood for tests to detect drugs that may camouflage lameness or that might contribute to the lameness and to determine if the horse has other conditions that might contribute to or affect lameness. 6. Radiographs/X-rays to identify damage or changes in bony structures. 7. 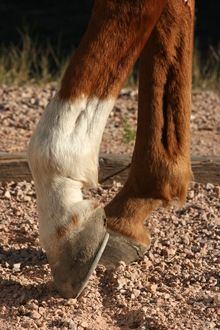 Analgesic techniques, including diagnostic regional nerve and joint blocks, to identify the location of the injury or stress that is causing the lameness. Working from the foot up, the veterinarian temporarily deadens sensation in specific parts of the limb, one joint at a time, until the lameness disappears. This procedure isolates the area of pain causing the lameness and also helps determine whether the condition is treatable. 8. Ultrasonography, nuclear scintigraphy (bone scan), or magnetic resonance imaging (MRI) to look for soft-tissue problems involving tendons, ligaments, joint surfaces, and muscle tissue. Computer tomography (CT) may be used for both tissue and bone problems. 9. Arthroscopy to allow for an optical examination of internal joint tissues or tendon sheaths. Arthroscopy requires general anesthesia, but may be the only way to fully determine the damage. 10. Samples of blood, synovial (joint) fluid, and tissue samples taken for examination to determine if infection or inflammation are present. These tests usually require laboratory evaluation before results are available. In many cases, the veterinarian will not need to complete an examination this extensive, and in other cases, different procedures may be followed, but the veterinarian's prime purpose is to diagnose your horse's problem and prescribe the treatment that will bring your horse back to the full potential of its athletic and work abilities. In addition, many veterinarians stay current with the latest technologies for diagnosing and treating lameness. A University of Missouri equine veterinarian has developed a way to detect lameness using a motion detection system called the "Lameness Locator." Kevin Keegan, a professor of equine surgery in the College of Veterinary Medicine at MU, has found that his Lameness Locator can detect lameness earlier than veterinarians using the traditional method of a subjective eye test enabling horse owners and veterinarians in early detection of developing cases of lameness. The Lameness Locator, which is now in commercial use, places small sensors on the horse's head, right front limb and croup, near the tail. The sensors monitor and record the horse's torso movement while the horse is trotting. The recorded information is then transferred to a computer or mobile device and compared against databases recorded from the movement of healthy horses and other lame horses. The computer is then able to diagnose whether or not the horse is lame. In any case, when your horse is lame, it is extremely important to follow up with any treatment your farrier or veterinarian recommends. Where there is indication that the lameness may become chronic, special care should be taken to follow treatment recommendations on an on-going basis.